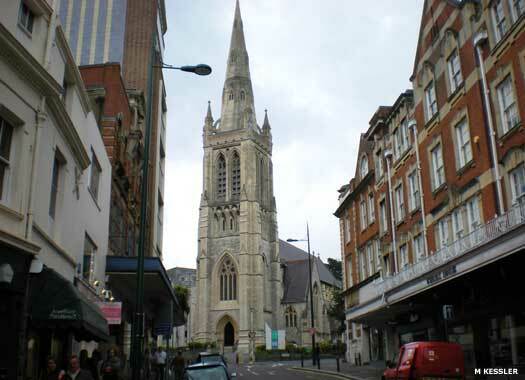 The Parish Church of St Peter is at the north-east corner of St Peter's Road and Hinton Road. Until the early nineteenth century the area where Bournemouth now stands was just heathland on which cattle grazed. In 1810 a man named Tregonwell visited the beach with his wife. She loved the area and persuaded him to build a house there. He purchased 8.5 acres and built a house with cottages for his butler and gardener, the first inhabitants of Bournemouth. 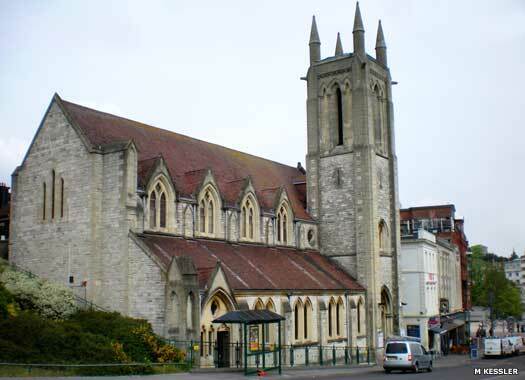 In 1837 the beginnings of modern Bournemouth began to be built up as a purpose-built seaside resort, and between 1853-1879 the present church of St Peter was built at the heart of the thriving town. The main architect was George Edmund Street. Mary Shelley, the writer and novelist, is buried here, as is the heart of her husband, Percy Bysshe Shelley, which was brought back from Italy. The town's Unitarian Church also meets here. 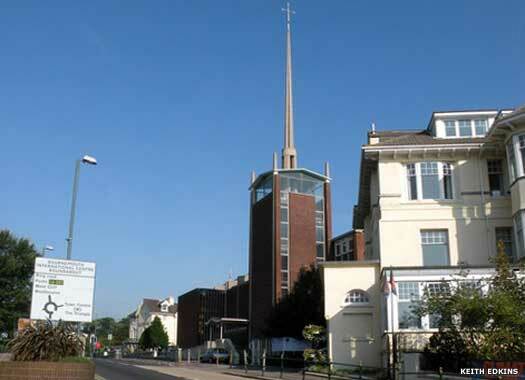 Punshon Memorial Methodist Church sits on the northern side of Exeter Road, opposite the Bournemouth International Centre (BiC). The church was built in 1958 and named after a nineteenth century Wesleyan preacher. In 2008 the building was acquired by a leading hotelier after years of negotiation. The building was still standing in 2009, but was expected to be demolished. The attached Church House was likely to be retained for its architectural features. St Andrew's Presbyterian Church stands between Exeter Road and Terrace Road at the junction between the two. The Presbyterians split from the Congregationalists and the church at the top of Richmond Hill shortly after it opened in 1856. In 1857 they built their own church of St Andrew, the Scotch Church, close to Southbourne Terrace, but this was demolished in 1886 to make way for business premises. Fortunately, a new site had already been secured. The present Grade II listed church was built in 1887. The Presbyterians and Congregationalists re-united nationally in 1972 and the church was no longer required, although it may have continued in use until about 1997 when it finally closed. 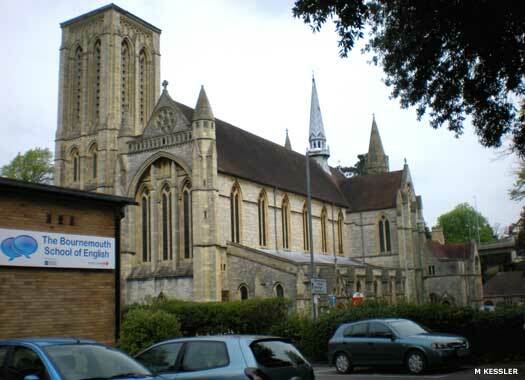 Richmond Hill United Reformed Church (see below) adopted its name around that time. For some years the church served as the Landmarc Theatre. By 2010, it had changed hands again and was now host to the trendy 'V Club'. St Stephen's Church is at the north-west corner of St Stephen's Way and St Stephen's Road. Public subscription provided the funds for the church, as a memorial to Alexander Morden Bennett, first vicar of St Peter's who died in 1880. 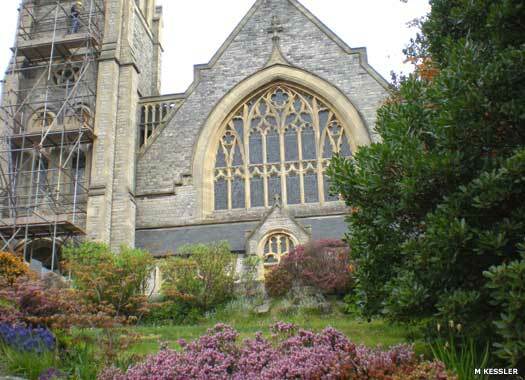 On 11 October 1881, the foundation stone was laid and dedicated by Bishop Harold Browne of Winchester. The church was completed in 1898, after being built in stages, and it replaced a mission church which stood a little to the south. By 1880 the great 'Oxford Movement', which brought fresh life and vigour to the Church of England, had spread throughout the country. 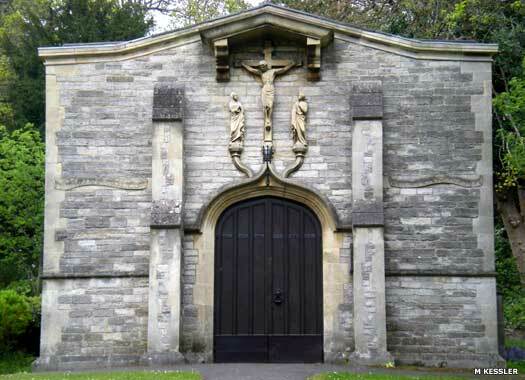 St Peter's Church was one of those in which the services were adapted to the new order of things. 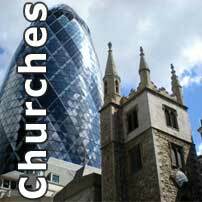 When its first vicar died it was feared that the church was reverting to the old state of things. So St Stephen's was built to carry on the Catholic tradition. 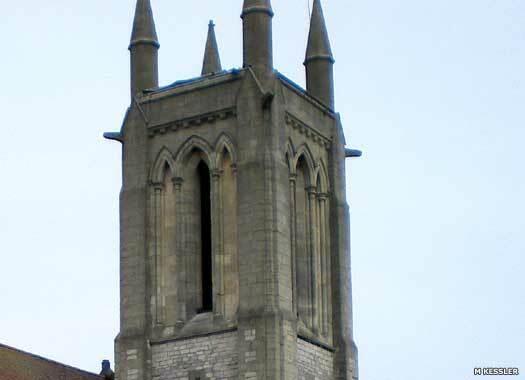 To this day the tower still lacks the spire which was intended for it. Richmond Hill St Andrew's United Reformed Church is on the north-east corner of Bourne Avenue and Braidley Road. The first church on the site was opened in 1856, founded jointly by Congregationalists and Presbyterians. Soon after, the latter founded St Andrew's Church (see above) at the foot of Richmond Hill. 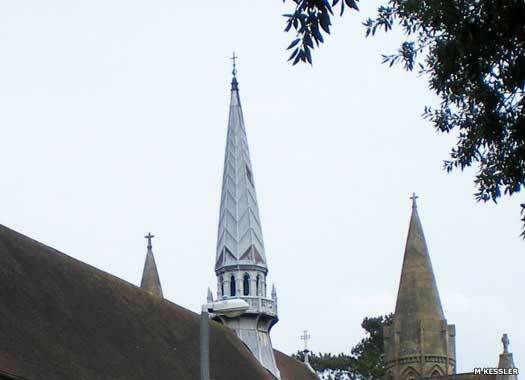 The Congregationalists soon found their building too small, and replaced it in 1891 by the largest place of worship in Bournemouth. The Presbyterians rejoined in 1972. Seven photos on this page contributed by M Kessler, and one photo licensed for re-use under a Creative Commons Licence by Keith Edkins at Geograph British Isles.